ConnectingSingles.nl is a 100% free Netherlands dating site for singles in Netherlands and worldwide. Make new friends, find dates, mates, and soulmates in Netherlands. Registration is easy and fast -just two short steps, you will then be free to contact other members and enjoy all site features without charge. Join the Group. Get Connected! Heard enough?? What have you got to lose? Come on in. Join the Group. Get Connected! ConnectingSingles.nl has everything you need to connect with new friends, people to talk to, things to do, and maybe... the absolute, love-of-your-life, perfect person for you. It's all here...and it's all FREE. 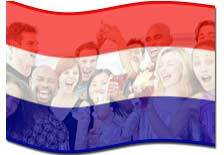 Ready to start meeting Netherlands singles? Many online dating sites claim to be free, and then surprise you with charges for features. At ConnectingSingles.nl, there are no costs and no credit cards needed here. No catches, No fees, No gimmicks......No Kidding! It's all here, it's all free. Ready to start dating in Netherlands?